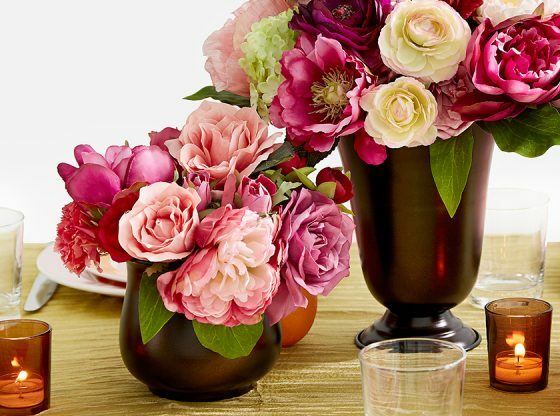 With pretty peonies, hyacinths, daffodils, and other spring flowers in full bloom, it’s easy to set a festive and colorful spring table for a dinner at home or a spring wedding. For our table we used a pretty mix of pink, green, pale yellow, and burgundy flowers for the centerpieces, arranged in a classic style with a lot of flowers and accented with a few leaves. What are your wedding colors? Get inspired by these pairings of gold, pink, burgundy, orange, cream, and brown. A colorful spring (or summer) tablescape. We used a mix of three antique copper and black metal containers with similar shapes for the centerpiece arrangements. This 6in antique copper bowl (shown at right), this taller antique black vase (center), and this curvy antique black vase. We used floral tape across the top of each vase to create a grid for these flower arrangements that are made entirely out of silk flowers (don’t they look incredibly real?!). Add a subtle glitter and visible texture to the tabletop itself with fabric that has the look of crinkled tissue paper, or a dupioni silk tablecloth. 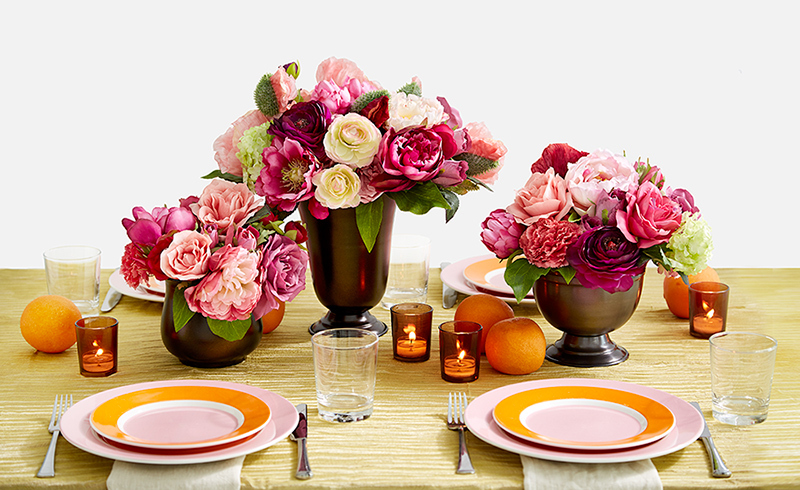 Play up the bright colors of the centerpieces with colorful plates like these pink and orange ones. Finish with candlelight to set the mood. These dark amber votive holders match the antique color of the vessels. Oranges add some more color to the tablescape, and here they also match the color of the plates, but any seasonal fruit with either a great color or beautiful texture would look great. As a fun takeaway, your guests can also each take an orange home for a snack.